On December 22, 2017, when SpaceX launched its Falcon 9 test rocket and lit up the skies of Los Angeles with a glowing orb of smoke, a not-insignificant number of Southern Californians began to believe the aliens had finally come to murder us all. I was there for that, and I can say with confidence that my vexation in that moment didn’t even approach what I felt when I first laid eyes on the latest Hearthstone reveal. 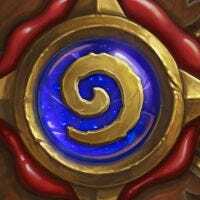 Every thirty days, we take a close look at a card that’s been getting a lot of buzz—good or bad—in the world of competitive Hearthstone. This new card from Hearthstone’s upcoming The Boomsday Project expansion is a Druid card so perverse and so powerful that I’m still trying to process what the catch might be. Here it is. Juicy Psychmelon. I honestly don’t even know what it has to do with the World of Warcraft universe. The art looks like something you’d find in the poster rack at a Spencer’s Gifts, or a hallucination that the cast of Super Mario Bros. 2 might have seen after a dose of off-brand LSD. And yet, holy hell, this card is so strong. Drawing four cards with a single card used to be a hard cap: the Rogue card called Sprint, from Hearthstone’s classic set, let you do it for 7 mana. Then Ultimate Infestation dropped, a 10-mana spell that lets you draw 5 cards (as well as deal 5 damage, gain 5 armor, and summon a 5/5 minion). At 10 mana, Ultimate Infestation was a big investment that requires you to give up your entire turn to play a single card—and even with that caveat, Ultimate Infestation has been regarded as one of the most powerful Hearthstone cards ever created. 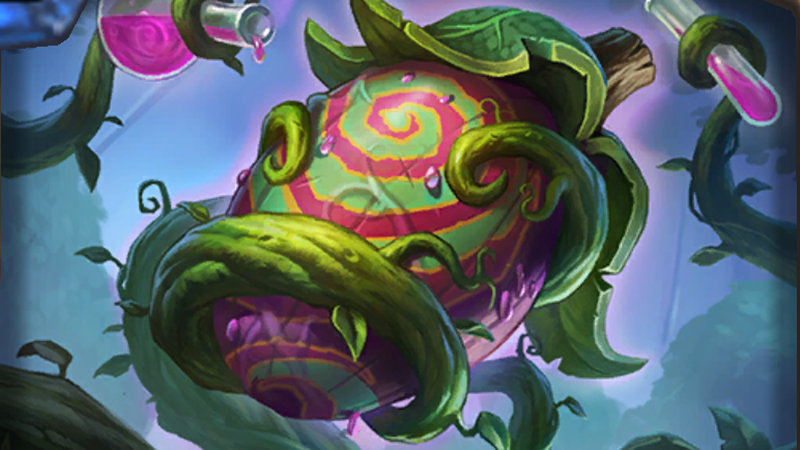 Now here comes this Barney the Dinosaur-looking melon that draws you almost as many cards as Ultimate Infestation for less than half the mana. Not only that, but you get to draw specific cards depending on how you’ve built your deck. To speak in the card game vernacular, it’s a cheaper Sprint that tutors. In Hearthstone’s Wild mode, where you can use cards from every expansion that’s ever been released, Druid is already one of the strongest classes thanks to a combo that relies on a very specific mix of 7-, 8-, 9-, and 10-mana minions. The fact that Druids can now draw this entire combo for 4 mana means that Wild players will face one of the game’s strongest combos on a much more consistent basis. Even in Standard mode, Psychmelon is still a force to be reckoned with. Even though Druids currently lack access to powerful 7- and 10-mana minions in Standard, it’s possible that either Blizzard will release cards to fill that void, or players will simply start running mediocre minions just to draw them with the Psychmelon. It’s not that far-fetched, actually, considering that some streamers like Thijs are already running just-ok 10-mana cards like Tyrantus in their Druid decks. When Juicy Psychmelon first dropped a few days ago, the /r/hearthstone subreddit erupted in rage over the card’s power level, which serves to boost a Druid class that’s already considered the most powerful in the game. Indeed, up until this point, it comes across as one of the strongest Hearthstone cards I’ve ever seen. But compared to a lot of the other cards that have already dropped from The Boomsday Project, the power level of Psychmelon looks to be about on par with the rest of being shown, which I think says more about this expansion than about the Juicy Psychmelon itself. My only hope is that Hearthstone becomes equally broken for all classes across the board, and not just Druid.